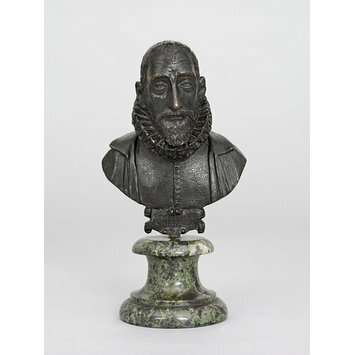 This intimate bust depicts Gabriello Chiabrera, one of the most distinguished poets of his time. His major work, the "Rapimento di Cefalo", was set to music by Giulio Caccini, the father of the sculptor who made the bust, Pompeo Caccini. The bust, known only in two versions, is the only known sculpture by Pompeo, who is documented as a painter in Florence, active from 1601-1615. The sensitive portrait shows the poet at the age of seventy-two. It may have been modelled when Chiabrera was in Florence in 1624, or perhaps when Caccini visited in Rome. Its small scale suggests a personal commission or a gift on the part of the artist, who proudly signed it on the back, and could have been kept within a studio or cabinet. The bust bears at the front on a scrolled cartouche beneath the truncation a cast inscription cut in the wax, and at the back in dotted characters worked with a point in the bronze another inscription. The doublet and cape are worked all over in the wax with a point. An integrally-cast tang springing from behind the cartouche has an original thread on the outside and a modern thread inside to attach the bust to its socle; the present waisted socle of green breccia marble is a modern replacement. 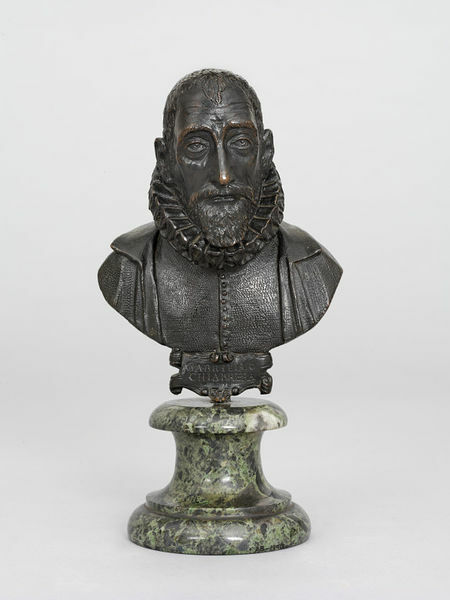 This bust portrays Gabriello Chiabrera (1552-1638), who was one of the most distinguished poets of his time. His major work, the "Rapimento di Cefalo", was set to music by Giulio Caccini. Only one other version is known at present which was exhibited at Detroit in 1958. Pompeo Caccini was the son of the musician and composer Giulio Caccini (b. Rome 1545-6; d. Florence 1613) and the nephew of the sculptor Giovanni Battista Caccini (b. Rome 1556; d. Florence 1613).